Innovation is a key source of competitive advantage, but it remains frustratingly elusive for many organizations. This book shows you how to close the innovation gap by making individuals and organizations systematically and sustainably innovative. You will learn how to embrace a culture of innovation and make it permeate every level of the organization. You will find a clear road map and practical tools to redefine your workplace's culture, identify and tap into the existing innovative intelligence, and develop leaders who can close the innovation gap for greater business success. Dr. David S. Weiss is President and CEO of Weiss International Ltd., a firm specializing in innovation, leadership, and Human Resources consulting. Previously Chief Innovation Officer in a multinational consulting firm, David's current university positions include Affiliate Professor at the Rotman School of Management of University of Toronto, and Senior Research Fellow of Queen's University. David is a sought-after keynote speaker who has presented at over 200 conferences and is the author or co-author of four best-selling business books: Leadership Solutions (2007), The Leadership Gap (2005), High Performance HR (2000), and Beyond The Walls of Conflict (1996). For more information, visit www.weissinternational.ca. Claude P. Legrand is the founder and President of Ideaction Inc., a consulting firm which specializes in sustainable innovation. For over 20 years he has been one of North America's leading experts in practical innovation and is an acclaimed and frequent conference presenter. He leads a team of experienced consultants who help organizations become innovation-capable and deliver major innovation projects. In 2007, he was the founding Program Director of the Centre of Excellence in Innovation Management at the Schulich Executive Education Centre. For more information, please visit www.ideaction.net. A Description of the Book Innovative Intelligence. PART ONE: CLOSING THE INNOVATION GAP. CHAPTER ONE: THE INNOVATION GAP. Innovative Thinking Makes Innovation Happen. The Evidence Is in—We Are Underachieving. CHAPTER TWO: LEADING THROUGH COMPLEXITY. Why Complex Issues Are So Challenging. CHAPTER THREE: ACCESSING INNOVATIVE INTELLIGENCE. Leaders Need to Think About Thinking. CHAPTER FOUR: ECLIPSE OF INNOVATIVE INTELLIGENCE. Eclipse #1: The School System Made Me Do It. Eclipse #2: The Analytical Intelligence Paradox. Eclipse #3: Impact of High Negative Stress. CHAPTER FIVE: INNOVATIVE THINKING: AN OVERVIEW. Characteristics of an Eff ective Innovative Thinking Model. Key Success Factors for Innovative Thinking. CHAPTER SIX: STEP 1: FRAMEWORK. The "How To . . .?" Question. Leveraging the Three Intelligences in the Framework Step. The Leader's Roles in Step 1: Framework. CHAPTER SEVEN: STEP 2: ISSUE REDEFINITION. The Five Areas of Focus in Issue Redefinition. Leveraging the Three Intelligences in the Issue Redefinition Step. The Leader's Roles in Step 2: Issue Redefinition. CHAPTER EIGHT: STEP 3: IDEA GENERATION. Idea Generation Is a Rigorous Process. Stage 2: Introduce the Process. Stage 3: Generate Many Ideas through Divergence. Stage 4: Discover Meaningful Solutions through Convergence. Working Alone on Idea Generation. Leveraging the Three Intelligences in the Idea Generation Step. The Leader's Role in Step 3: Idea Generation. CHAPTER NINE: STEP 4: IMPLEMENTATION PLANNING. Stage 1: Confi rm the Preferred Idea. Stage 2: Engage in Risk Analysis and Develop Mitigating Strategies. Stage 3: Present the Innovative Solution for Approval. Stage 4: Ensure an Eff ective Handoff to the Team that Focuses on Change Implementation. Leveraging the Three Intelligences in the Implementation Planning Step. The Leader’s Role in Step 4: Implementation Planning. PART THREE: MAKING INNOVATION HAPPEN. CHAPTER TEN: MAKING INNOVATION HAPPEN: AN OVERVIEW. Four Essential Organizational Enablers to Make Innovation Happen. CHAPTER TWELVE: CULTURE OF INNOVATION. How a Culture Can Suppress Innovation. How an Existing Culture Can Be Transformed to a Culture of Innovation. How to Develop a Leadership Culture of Innovation. 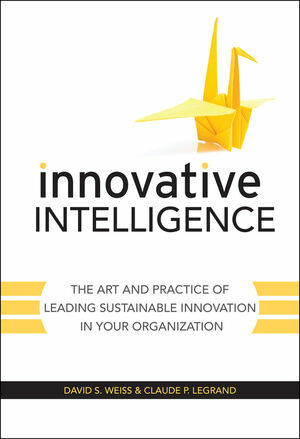 CHAPTER THIRTEEN: ORGANIZATIONAL PRACTICES FOR INNOVATION. Organizational Practices in Core Functional Areas. Organizational Practices in Support Functional Areas. CHAPTER FOURTEEN: THE INNOVATION PLAN. Guiding Principles for an Innovation Plan. Key Elements of an Effective Innovation Plan. How to Develop the Innovation Plan and Who Should Lead It. When Should an Innovation Plan Be Developed?